Upon disembarkation at the Kaohsiung cruise terminal, you'll find pedicabs by the big trees right in front of you. As they are rarely found on the island, don't hesitate to go for a ride, or you'd have to wait for a long time since they don't come in large numbers. A brand new cruise terminal is in the works. It will be spectacular. The new boardwalk links the new Pop Music Center, the arts and shopping districts within a green necklace along the waterfront. The boardwalk will be a 24 hour space that fosters shopping, dining, and recreation. 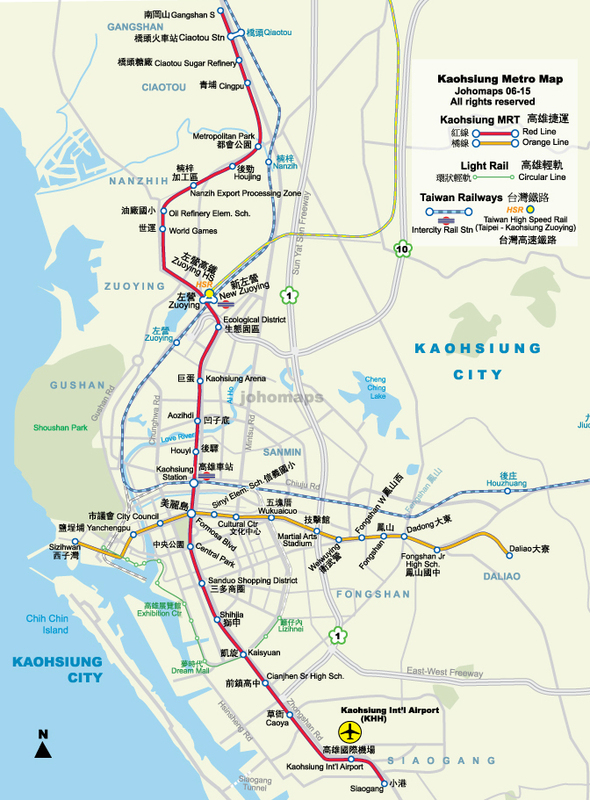 Kaohsiung, well known as the second largest city in Taiwan and the third largest container terminal in the world (after Hong Kong and Singapore), is also a major industrial center. Highly industrialized and commercialized as it is, Kaohsiung still has many tourism resources and facilities: the residents are hospitable, transportation is convenient, and the climate is comfortable. Now the city is improving its sight-seeing areas in an effort to make itself an important tourist destination. Its year-round fine weather and the low cost of living makes Kaohsiung the place to visit. The Cijin District is a slender island in Kaohsiung harbor which serves as a natural breakwater for the harbor. The district is filled with seafood restaurants selling freshly caught seafood which can be prepared right after you pick it out. Cijin is connected to the rest of Kaohsiung City by underwater tunnels, but the transportation of choice is one of the many ferries that traverse the harbor. Fare for the ferry ride is NT$15 per person. Exploring Kaohsiung on foot is highly recommended, as many of the distances between sites of interest are not far. Dream Mall is the largest shopping mall in Taiwan and 2nd largest in Asia. The mall is a bit out of the way, but worth it to visit the Hello Kitty Ferris Wheel on the roof. As in many Asian countries, night markets are a staple of Taiwanese entertainment, shopping and eating. Night markets are open-air markets, usually on a street or alleyway, with vendors selling all sorts of wares on every side. Bargaining is normally frowned upon. The currency of Taiwan is the New Taiwan Dollar (NTD, but also referred to as TWD). An easy rule of thumb is that NT$100 roughly equals US$3. Plenty of ATM's around. Most hotels and department stores accept credit cards, most restaurants and small stores do not! Cafes which offer free WiFi for customers are plentiful, although you may have to wander around before finding one. Rather, Cafes which offer free WiFi for customers in Taiwan should be called gaming cafes. There seem not set opening hours for stores, it seems as long as there are customers they stay open. Chinese New Year,6 days long, is the time when all the Taiwanese are traveling and transportation can be very hectic.